There are several ways to bring fresh air into our homes. Ventilation systems can be natural, mechanical or hybrid (a combination of the two). There are two ways to ventilate or cool buildings: actively or passively. Active ventilation/cooling refers to systems where mechanical components or other energy-consuming components (such as air-conditioning systems) are used. Passive ventilation/cooling is a technology or design feature used to ventilate/ cool buildings with no energy consumption (e.g. natural ventilation by openable windows). Passive cooling techniques are described further in chapter 3 Thermal Comfort. Natural ventilation uses natural forces to exchange the air in a building. The driving forces are wind and temperature differences, as explained further in section 2.5.1. In residential buildings, air is often supplied through the facade and extract air is removed from selected rooms (often kitchen and bathrooms) through ducts, as illustrated in Figure 2.2.6. The air supply can be through fresh air grilles in the facade or through the ventilation flaps of VELUX roof windows. It can also enter through leakages in the facade. It is important to ensure an efficient air flow path through the building, see section 2.6.1. ​Figure 2.4.1 Common natural and mechanical ventilation systems. Mechanical ventilation systems use electric fans to direct the airflow in the building. Mechanical ventilation can provide a constant air change rate independently of external weather conditions, but it uses electricity and usually cannot change the ventilation rate as the need changes over the day and year. Several variations exist, as illustrated in Figure 2.4.1. Systems with both supply and extract can be combined with a heat recovery unit, which recovers (reuses) the heat of the extract air that would otherwise be lost. Up to 90% of the energy can be ‘reused’. It is becoming a standard solution in many North European countries for newbuilt houses to be provided with mechanical heat recovery ventilation in order to meet current energy requirements. This is a very energy efficient solution for the heating (winter) season. However, in the summer season, electricity for running of fans can be saved by using natural ventilation. Systems shifting between natural ventilation and mechanical ventilation are called hybrid ventilation systems. Mechanical ventilation requires filters to be changed regularly. Dirty filters are a source of pollution of the indoor air and reduce indoor air quality, which, in turn, reduces the performance of the occupants of the building and increases the prevalence of SBS symptoms (Wargocki et al., 2002; Bekö, 2009). It has been found that SBS symptoms occur more frequently in buildings with air conditioning than in naturally ventilated buildings (Wargocki et al., 2002). If a mechanical ventilation system with heat recovery is to perform energy efficiently, the building must be perfectly airtight. If it is not, a substantial part of the ventilation will come from infiltration, which bypasses the heat exchanger. So mechanical ventilation with heat recovery is often not an energy-correct solution for existing buildings – unless they are made more airtight. Mechanical ventilation systems can be central or decentral. Central systems have one central unit, with supply and extract fans; if the system has heat recovery, the heat recovery unit is included in the central unit. Ventilation ducts are installed from the unit to most rooms of the house. Decentral ventilation does not use ducts; instead, small units, which can include heat recovery, are installed in individual rooms of a house. Such a system has the advantage of not requiring space for ducts. Hybrid ventilation is is a system that combines natural and mechanical ventilation. Hybrid ventilation is a relevant solution for new residential buildings, especially if roof windows are available to facilitate stack effect. 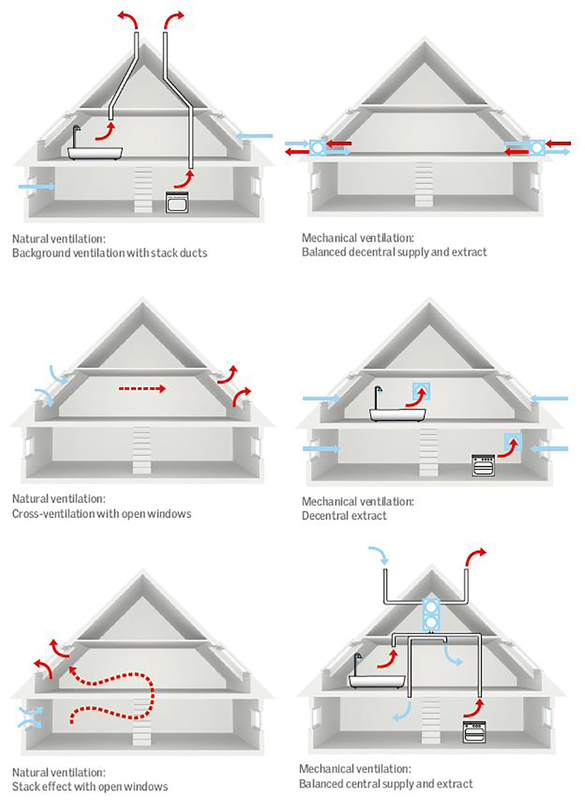 Several variations of hybrid ventilation systems exist. Mechanical ventilation is used in the heating period and natural ventilation in the rest of the year. This principle provides a good energy performance for newbuilt houses and works well in combination with VELUX roof windows. This principle is mainly used in larger commercial buildings where the natural driving forces are inadequate in some periods. A fan is therefore used for assistance. This principle is also used mainly in larger commercial buildings, where the ventilation system is designed with ducts to transport the air, and natural driving forces provide most of the airflow – with fans used for assistance. Hybrid ventilation is used to optimise the indoor environment while reducing energy costs. As mentioned, mechanical ventilation with heat recovery is used in new houses to reduce the heating demand and to allow the house to meet energy requirements for heating. But during the warm part of the year, it is more energy efficient to use natural ventilation to reduce the electricity demand for the electric fans. Furthermore, open windows are appreciated by most users in the warm part of the year. Hybrid ventilation combines the best of both worlds: good winter energy performance with mechanical heat recovery ventilation, and good summer performance with natural ventilation. ​Figure 2.4.2 Three principles of hybrid ventilation systems (Heiselberg, 2002). An example of how much energy can be saved with hybrid ventilation compared to mechanical heat recovery ventilation. Typical houses in Istanbul, Paris and Copenhagen are being investigated. Natural ventilation is used whenever it is warm enough to make heat recovery ventilation unnecessary (Foldbjerg et al., 2010). ​​Figure 2.4.3 in Paris and Copenhagen, natural ventilation is more energy efficient than heat recovery ventilation for 36-39% of the year; in Istanbul that figure is 55% of the year. ​Figure 2.4.4 Hybrid ventilation is more energy efficient than mechanical heat recovery ventilation in Istanbul, Paris and Copenhagen. 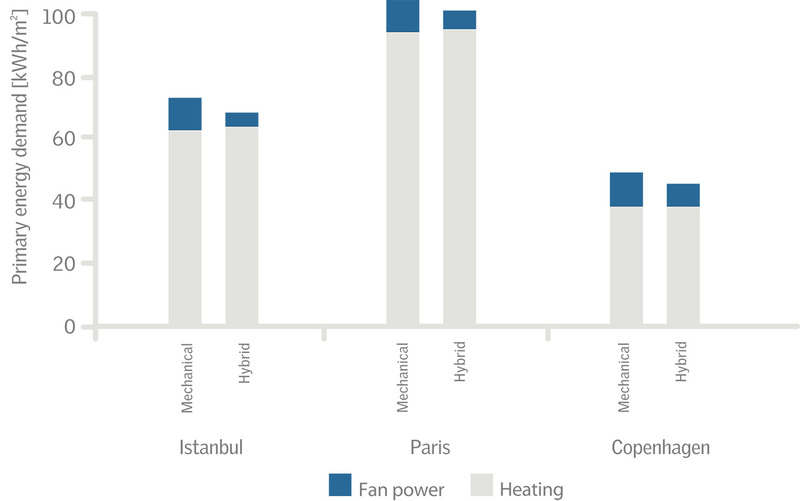 The annual primary energy savings range from 3 kWh/m² in Paris to 5 kWh/m² in Istanbul. This is compared to the maximum primary energy demand in the table below. Three periods of construction are being invesitgated, and it can be seen that the relative reduction increases from 5% for a recent building to 9% for a future building. ​Figure 2.4.5 Potential primary energy savings by using hybrid ventilation instead of mechanical ventilation with heat recovery. Based on requirements from the Danish building code (Danish Enterprise and Construction Authority, 2010). For newbuilt houses, hybrid ventilation can be a very cost-efficient solution to reduce the energy demand and make the house meet the energy requirements. To achieve a low energy demand, the alternative to hybrid ventilation could be additional insulation, photovoltaics etc., which may be more costly solutions. Hybrid ventilation is more energy efficient than mechanical ventilation with heat recovery because of the saved electricity in the summer time. In reality, the need for ventilation changes constantly and the ventilation rate should be increased when cooking, cleaning or many people are present in the house. When the house is left during the day, the need for ventilation is reduced. A house in London is investigated with VELUX Energy and Indoor Climate Visualizer. It is occupied by five people, and has an internal floor area of 175 m². The CO2 ­level is determined for two constant air change rates: 0.3 ACH and 0.5 ACH. The results show that at 0.5 ACH, the CO2 ­level will be below 750 ppm, which indicates that the air quality will be very good. At 0.3 ACH, the CO2­ level will be above 900 ppm, which indicates that the air quality is just acceptable for existing buildings and could be improved. At 0.5 ACH, the relative humidity averages 42% during the winter months, while it is 59% for 0.3 ACH. Recommended relative humidity for this part of the year is below 45%; this is achieved at 0.5 ACH, but at 0.3 ACH the relative humidity is too high, which means that there is a risk of mould growth and an increased risk of moisture­-related illnesses. For the investigated house, the air quality will be very good at a ventilation rate of 0.5 ACH and poor at 0.3 ACH. For residential buildings, the ventilation rate can be controlled based on the humidity level and CO2 concentration. The actual need for ventilation changes constantly and demand- controlled ventilation will provide the best compromise between air quality and energy consumption. Bekö, G. (2009) Used Filters and Indoor Air Quality, ASHRAE Journal, vol. 7, no. March. Foldbjerg P., Asmussen, T. F., Duer K. (2010) Hybrid ventilation as a cost-effective ventilation solution for low-energy residential buildings, Proceedings of Clima2010. Wargocki P, Sundell J, Bischof W, Brundrett, G., Fanger P. O., Gyntelberg F., Hanssen S. O., Harrison P., Pickering A., Seppänen O., Wouters P. (2002), Ventilation and health in non-industrial indoor environments: report from a European multidisciplinary scientific consensus meeting (EUROVEN), IndoorAir, vol. 12, no. 2, pp. 113-28.